It's not just a song, it's an indictment of a teen daughter trying to get out of helping with Thanksgiving dinner. 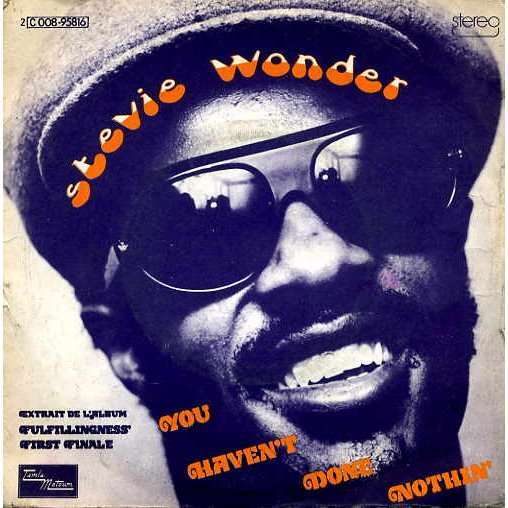 The title of Chapter 10, "You Haven’t Done Nothin’" comes from Stevie Wonder's 1974 album Fulfillingness' First Finale. Karen is listening to the record repeatedly, soaking up as much Stevie as she can - and trying to drown out the preparations in the kitchen below. Dinner will bring her estranged parents together for the first time in more than a year, and she is emphatically not looking forward to it. Being a self-absorbed teen, she has no problem sharing her opinion with her mother, who is desperately seeking some help as the clock ticks down. The song, featuring the Jackson 5 singing background, was a number 1 pop hit. It's a powerful anti-Nixon statement ("We are sick and tired of hearing your song/Telling how you are gonna change right from wrong"). Just to reinforce the message, the single's B side was "Big Brother" from 1972's Talking Book, also a slam against politicians ("I live in the ghetto/You just come to visit me 'round election time").